After seeing my P90X results, my wife was saying “I can’t believe this is my husband! I had gone to the gym off and on for years, always falling back into the same routine. When I saw a friend do P90X and have faster results than I had ever achieved, I was inspired! So then I started P90X and the Shakeology meal replacement. All together, I dropped 36lbs of fat and gained 8 lbs of muscle in 6 months. I went from 25% body fat to 9.4% body fat and ended up at 177lbs! So I did another round of P90X, with a focus on GAINING MASS, 12 lbs in 13 weeks and only gained 1% bodyfat! P90X Transformation 1 year update! After my MASS GAINING round of P90X, I did Insanity Asylum to cut back up and ended up at 177 lbs, 7.5% body fat!!! After a busy career in marketing, 3 children, school in the evenings, being a Boy Scout leader and an active member at Church, my health had been neglected! The stress and poor sleeping habits had taken their toll on my body! Reaching 205lbs, high cholesterol and little energy was enough for me to want a change. After just 6 months, I’m in the best shape of my life and my friends & family are amazed at my results. I’m still super busy but the stress is gone and I have tons of energy. At Thanksgiving, my sister said I looked 10 years younger! Pull-ups are a big part of the p90x program for building back strength. At the beginning, I could barely do 3. By the end, I was able to do 16 unassisted pull-ups! I’ve always preferred the gym for working out but after going through P90X, I’m convinced that working out at home is not only just as effective, it’s a lot more convenient! I haven’t been to the gym in 90 days and have no plans to return. My wife was so impressed with my results, she suspended her gym membership and did TurboFire (another Beachbody workout aimed towards women). I’m excited to share how I did it and “pay it forward” by helping others achieve similar results. My results were so impressive that I was asked to be a Beachbody coach and help other people become fit. If YOU would like to be the next success story and get into the best shape of your life, I’m here to help. There were 3 “wake-up calls” that got my attention. I went on a 5 mile back-packing hike with the Boy Scouts and practically killed myself trying to keep up with them. At one point, I could only take 10 steps at a time before needing another break. I ended the hike DEAD LAST and very embarrassed. I went to get an annual checkup and was surprised by the results. For the first time in my life, the nurse told me that my cholesterol was too high! Huh, who, me? But Ice cream is so good! There must have been a mistake. I needed an extreme fitness program, I needed P90X! When I started P90X, I was mentally ready to stay dedicated to the program and give it my all. In EVERY workout, I brought it and pushed myself until I was totally exhausted. I’ve never sweat so much and it felt great to flush the toxins out. I sustained an average heart rate of 150 with peaks into the 170s! When the little voice of doubt told me to stop, I pushed harder. Sometimes by the end, I collapsed to the floor but I always got back up, drank my recovery drink and got ready for the next day’s workout. Even with my crazy schedule, I still got my workouts in. Most of the time they were in the evening but on some days, they were at midnight. On business trips, I brought p90x on my ipad and used the hotel’s gym. During Thanksgiving, I brought all my gear and supplements and never missed a beat. Even during Christmas vacation to Hawaii, I didn’t miss a work-out. I made health a top priority and backed it up with every choice I made to eat, drink and exercise each and every day. What did I learn? That Nutrition will make up 70% of your results! Fortunately, the P90X Nutrition Plan is simple to follow. Total body solution – it doesn’t just burn fat and build muscle, it improves flexibility, agility, coordination, balance and core strength. In addition to lifting, it includes yoga, plyometrics, Kenpo and stretching. Convenience – in the time it takes for me to just drive to/from the gym, I can have half my p90x workout done! With my busy schedule, this is a must. Having a coach – I can’t recommend this enough. Having a coach who has gone through the program before, has run into obstacles and overcome them is very important. You will have questions and a coach can help you! Community Support – There will be times when your motivation will wane and you’ll need to lean on others for support. You may need a dose of inspiration. That’s what the TeamBeachbody.com community is all about! Shakeology – When it comes to nutrition, it doesn’t get any better than this. This meal replacement gave my body the right nutrition it needed to lose the fat, build muscle and flush away the toxins! My skin, hair, eyes, nails all look healthier. Are YOU thinking of doing P90X, Insanity Asylum or Shakeology? If you buy them through this site, I’ll coach you for free! I was blessed with really good health but I had started taking it for granted. When I was younger, every time I had an annual exam, my results showed that I had great blood pressure, cholesterol and triglycerides, etc. By the time I reached 30 years old, it finally caught up with me. When the results came back that my cholesterol was too high, I was stunned. My doctor said “I’ve haven’t seen results this good in years”. I was ECSTATIC to hear this!!! Watch my 6 month P90x Results video on Youtube. Watch my 10 month P90X Transformation video on Youtube. David, I stumbled onto your site and glad I did, your results are inspirational. I just ordered Jillian’s book based on your comments. My gf & I are starting P90X next week after a 60 “try-out” earlier in the year. Keep up the good work. I appreciate the feedback. This time, you have to take it to the end, okay? Remember, what you put into it is what you will get out of it. If you dedicate yourself, not only will your body be better when it’s over, YOU will be a better person. It teaches self discipline. I’m glad you are here with us. I just started up our message board on TeamBeachBody.com (see the yellow link on the front page of this site). You guys should stop by and join us for daily support. My wife, sisters and several other friends will all be there going through the programs! First of all great work! I would say that I am close to your 9/24/10 pics. I am 176lbs with 18% BF. It’s incredible that you went from the pics in September to the end of the 90 days in December. What a great transformation, congrats! did it in terms of getting the most results. I think the bottom like is eat clean and natural foods and you can’t go wrong. Thanks for the feedback! If you’re already starting at 176lbs and 18% BF then you’ll be able to get ripped pretty quickly. I followed P90X Nutrition Plan in the sense that I used the calorie ratios 50/30/20 and then 40/40/20 and I increased my overall calories. But as far as foods, any time Master Your Metabolism is “stricter”, I followed that. For instance, there are some foods that are on the P90X Approved list but ARE NOT good based on Master your Metabolism. In those cases, I followed MYM. I also believe that to optimize your nutrition, there are a several key supplements that help. Our food supply has declined in quality over the last 20-30 years. There just aren’t the right vitamins and nutrients in our foods anymore (even whole and organic). I supplement with whole food vitamins, krill oil, shakeology and calcium, in addition to eating healthy. Yes, I am doing P90x and am on day 20. I feel like I can already see and feel a difference. I would think I was around 182 lbs and 20+% when I started but I didn’t measure the BF so I’m not sure about that. I definately want to make the most out of the next 70 days diet wise. Currently I take a GNC Multi-vitamin, as well as some Pure Creatine, and Whey protein for recovery after my workouts. I had some Flaxseed oil to it as well and take Omega-3 Fish Oil capsules. Outside of the food this is pretty much all I’ve added. Great idea to go with the stricter of the two discilplines. 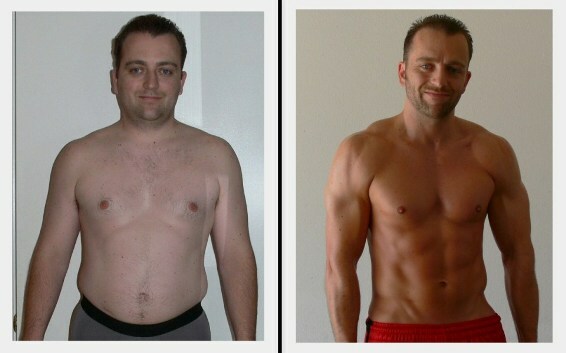 So those were your results from P90x..amazing! Great work! Appreciate you posting your story. Completed one round of Insanity, one round of the Asylum, and now in the Insanity/Asylum hybrid. Hope to add P90X and P90X2 soon. Quick question — I noticed your chin-up bar in the video. Is that something you made yourself or did you purchase it somewhere? That would work much better in the set-up of my workout space than a door-mounted bar, so thought I would see if you had any info you could send along on how to put it together. Thanks! Hey Chad..thanks for the feedback. So are you seeing good results with Insanity and Asylum? I found that nutrition is 70% of the results. So to your question, when I installed the pullup bar, I recorded video on how to do it. I also have a parts list. I just need to get some spare time and I’ll put together a video showing how to do it. I got all the parts at Lowes for about $45. I love it.. so much more secure and allows free range of motion.. I can swing on it..haha.